The references and links on this page were compiled for the sole purpose of providing additional information for seniors, their families and friends. Koelsch Communities is not liable for content, nor does this act as an endorsement of products or services. 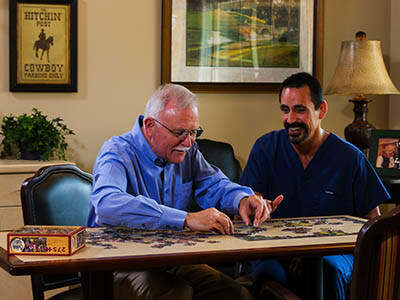 Leading organization on Alzheimer's that provides referrals, research and support throughout the world. A national health agency providing research, publications and support in order to reduce the likelihood of disability and death from cardiovascular diseases and stroke. Sponsored by the web-based Health Education Foundation, this site contains health information written and edited by medical professionals who seek to improve the quality of life and lower care costs for all who use the site. A non-profit organization for individuals 50 and over that focuses on health and wellness, economic security and work, long-term care and independent living and personal enrichment. Serves as a primary source on long-term case issues for professionals, policy makers and family caregivers around the country. An award-winning Federal Web site, Health Finder was developed by the U.S. Department of Health and Human Services. An award-winning site developed by the Joint U.S. National Library of Medicine and the National Institutes of Health. Extensive health care resources used by public and professionals. Site developed by Merck & Co. Inc., authors of the Merck Manual, serves as a professional source for information on health conditions, resources and prevention. A major research center in the U.S., the National Institutes of Health has 27 separate research centers and is part of the U.S. Department of Health and Human Services. Is the only nonprofit, charity organization dedicated to ending mesothelioma and the suffering caused by it, by funding research, providing education and support for patients and their families, and by advocating for federal funding of mesothelioma research.